I spent the end of last week roaming around Emerald City Comicon in Seattle. Every year the three day event gathers together a variety of artists, cosplayers, designers, animators, gamers, and fanboys who come together to celebrate the graphic arts and the imagination. I can’t count the number of times over the course of those three days that I saw people reach for a notebook, device, or even a napkin to sketch an idea. It got me thinking about the role sketching plays in our process and what a powerful first step it can be for rapid idea generation, or just having a great time on a Saturday afternoon. Yes, it’s true. The fantastic thing about sketching is that it doesn’t take a lot to get started. If you can master the art of the line and circle, you’re on your way. Add a triangle and square to your list of shapes and you’ve doubled your sketching power. 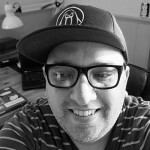 Aaron Draplin of the DDC made a comment in his Skillshare series on logo design that rings true. If you pay attention to most of the things around you, you’ll notice that they’re largely made up of primary shapes (square, circle, rectangle, triangle, line). So, it just makes sense that if we can master the basics, we can draw the basics. 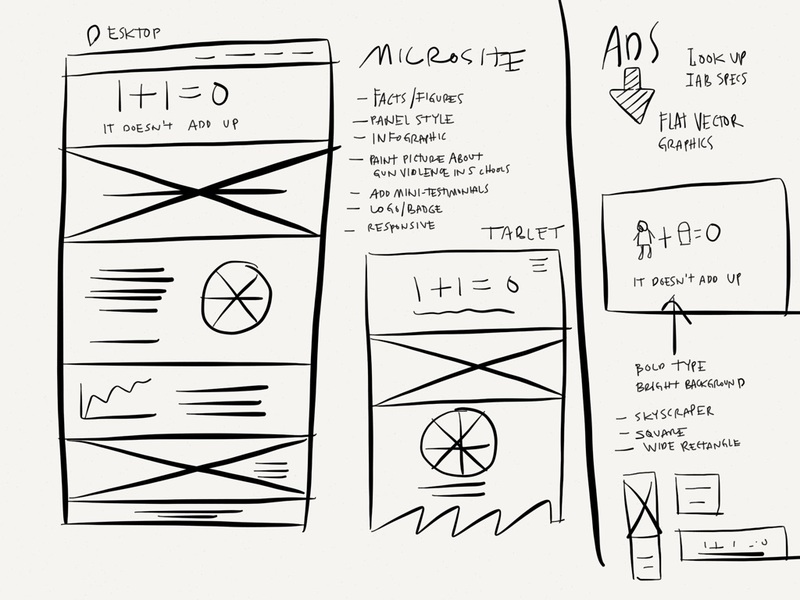 Rough website sketches help explore different layout options while formulating thoughts. Sketching takes time, but it’s reward is immediate in that you get better with each line you draw. The progress might not be readily apparent, but over a short course of time (and regular sketching) things are bound to get easier. Your new found doodle process will lead to stronger compositional skills which can be put to work on a variety of projects. It doesn’t take much. Generally, if you can lay your hands on a pencil or pen and some type of paper you’re ready to get started. But be forewarned, everyone who sketches on a regular basis has their favorite weapons of mass creation. Advice is great, but find what’s most comfortable for you through experimentation with different types of paper, pen and pencil. I personally prefer a Bloc Rhodia No. 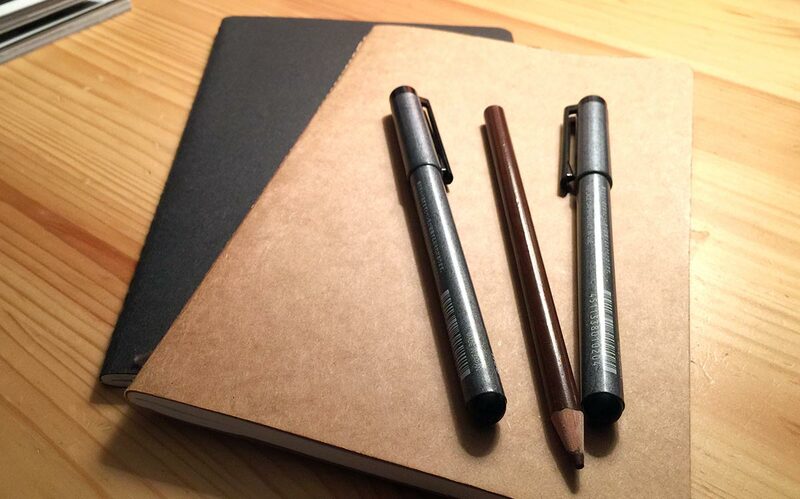 13, GraphicGear500 mechanical pencil, and a felt tip pen. But hey, who’s keeping track? Don’t forget that traditional methods are not the only way to get into sketching. If you have some type of tablet or mobile device there are a range of software options to get you working. It takes a bit of getting used to, but this type of drawing can be even faster and more accessible than going at it with a sketchbook and pencil. As an aside, one of the biggest benefits has to be multiple undos. If you’re on an iPad, check out Paper, or Adobe Ideas is great on both iOS and Android. Employing your new found skills in the studio doesn’t take much. Design sketching, as it has come to be known, allows individuals and teams to rapidly generate ideas with very little time and cost incurred. 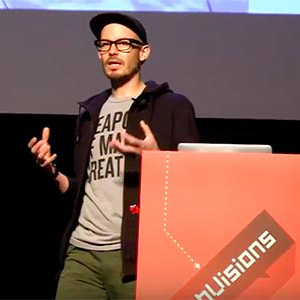 It’s also a fast way to test ideas without cracking open an Adobe program or firing off a line of code. Less haste, less waste. 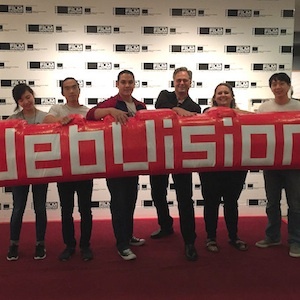 Through a process of sketching and iteration, it’s possible to shave hundreds or thousands of dollars off the bottom line of the teams’ production budget. If you look at most of the other fields in the graphic arts, sketching is the primary entry point to just about every new project. Filmmakers start with storyboards, architects start with basic renderings or sketches, animators start with character sketches, and industrial designers start with product sketching. In all of these cases, starting with a set of drawings allows for the exploration of the problem with minimal investment. 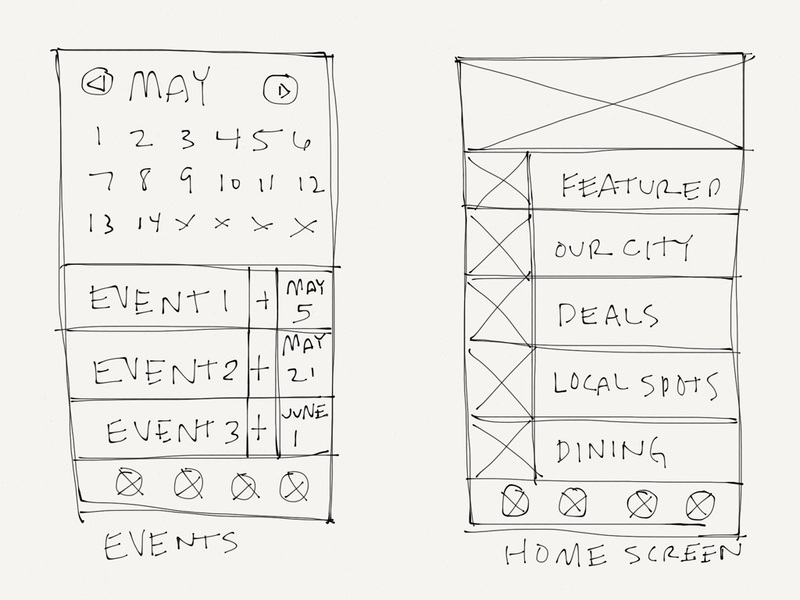 Sketched low-fidelity wireframes assist in early design decisions. Over the past few years the storyboard has become a powerful tool aiding design teams in a variety of exercises, such as mapping the user experience and software design. It’s one step up from basic sketching as it also interweaves narrative storytelling into the mix. Yet, it’s all attainable. Remember, anyone can sketch. Employing a round of sketching at the start of a design phase is a great way to crack into the problem and come away with a huge result. 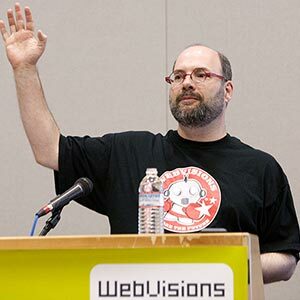 It’s possible to generate dozens of ideas from a session that will help to define a strong direction, while also ferreting out the stinkers. However your team goes about it, design sketching is the place to start. Yes, anyone can sketch, it just takes a bit of time, a few tools, and an idea (or two or three). A regular sketching routine over time will help us become stronger communicators and idea generators, and that’s a recipe for success. Photograph and Illustrations by Erin Lynch.